Last Wednesday evening I finished stitching all I could on the first border of Sue Garman’s “Friends of Baltimore”. I filled the sink with hot soapy water and let the border soak for a while. I use hot water because I think the glue and starch soften quicker in hot water…maybe it does, maybe it doesn’t, but that is just what I do! Next, I like to use Soak in the water, but if I don’t have any Soak on hand, I use dish soap. I normally let it soak for an hour or two. When I went to take the border out of the water, I was mildly shocked to see that most of the red fabrics had run into the white background. After doing a quick bit of research online, I jumped in the car and went shopping for some Oxy-Clean and some color magnet sheets. Luckily, I found them, came home and threw the border into the washing machine with both products. I am happy (and sooooo relieved) to tell you the border came out of the washing machine without a speck of red dye on it. Thank you, Quilting Gods! The following day, I laid the border out on a towel and let it dry. Once it was dry, I placed the border onto the pattern and marked the cutting lines with a water soluble marker. I always cut my background pieces larger than the pattern calls for, so they need to trimmed to the correct size. Next, I stitched the border on. When I went to press the seam flat, I noticed that some of the navy blue fabric had frayed, and it was sticking out past the seam allowance. I very carefully trimmed off the navy blue bits. I mean….very, very carefully! I promised myself once I had the first border stitched on, I would start the next block of Ladies of the Sea, another Sue Garman pattern. The ship on this block is called The Xebec Pirate Ship. It looks very interesting with that skull and crossbones! I used a gradient fabric for the bias stems. If you look closely, you will see the color goes from light to dark green. Fun! One day (when I have time!) I am going to do some research on cats and quilts. I had not seen Bruin all morning. I placed my quilt on the floor so I could take a picture of it. I went to find my camera and this is what I returned to find. Sheesh! I only have two words for this piece, gorgeous, gorgeous. Yes, your work is inspiring. That Friends of Baltimore quilt is looking fabulous. I really enjoy the way you give us tips. Thank you for sharing! It’s lovely! But I think I might have had heart failure looking at red bleed. I’m glad you were able to get it out. I’ve heard of using sythrapol, and have used retayan when prewashing fabrics, but I’d not heard of the oxy-clean and color catcher method. Just wondering, did you experience red bleed in your blocks too, or did you use a different red in your border than your blocks? I’m working on the same, Friends of Baltimore, only I’m way behind you on progress. The reds I’m using are some Kona solids and several different red prints. I have not tested them all for colorfastness, and am now concerned. So glad you got it out. I prewashed all of my fabrics in synthrapol. It’s a mystery becasue I am using all of the same fabric in my blocks and borders. This is the first time anything bled. Kerry your work is stunning. I too would love to make the ladies of the sea pattern but it is out if my price range. I have it on my ebay saved searches in case anyone ever sells it for a lower price. I look forward to seeing your progress. Have you ever had any block bleed when you Soak it? Thanks! This is the first time I ever had a block bleed. Scary stuff! Wow…Kerry….it is magnificent. What beautiful work you do! I LOVE it. I have had that same thing happen with color bleeding, only with a dark blue (that had been previously washed)! I was able to get it all out as well with the same method. Thanks for sharing your work! Glad to share! 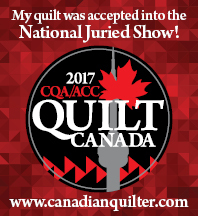 Nice to know none of are alone with our quilting catastrophies! Your border looks fantastic!! Glad you could get the runs out!! Ha Ha! I see what you did there!! You are a superstar! I’ve got to visit here more often, I’m so inspired! BTW I learned the hrd way and lost a beautiful finished quilt top to bleeding reds. (This was before color catchers were out there…). Consequently, I always prewash REDS. I never do with any other color – I just don’t trust reds! When I finish a quilt I always throw a color catcher or 2 in the wash, just to be extra safe. LOVE your work – thanks for blogging about it! Thanks! I am glad you enjoy the blog! Cats don’t like things out of place. It sounds funny but it is true. Test it sometime when the cat is in the room drop a magazine or something on the floor. Usually within a few minutes most cats will go and sit or lay on it. Bruin obviously has very good taste!! Beautiful work. He is a character! He makes me laugh all day long! What beautiful work – so pleased the red dye came out! Beautiful applique work — how long have you been working on this one? I have been working on this quilt for over 2 years now. But, I always have 3 or 4 projects on the go so I have not been working on it exclusively. Every quilt you do is my new favorite! So glad that dye came out! I’m going to remember that trick. Thanks so much, Wendi! Hope all is well with you and your family! Came to your blog from Esther’s WOW and I’m so happy to see your postings! I’m new to hand applique and love it when experienced appliquers post pics that show the actual work. Seldom does anyone show the back of their work and it is fascinating to me to see the size of your stitches. Thanks so much for sharing! I am glad to share everything I know about applique, especially newbies! Synthrapol will get the colors that bleed out of fabrics. Be sure to wash in hot water with and include color catchers. I always wash my fabric in Synthrapol, which is why I was so mystified when the red ran! A mystery, to be sure! OMG my heart sank when I saw your border in hot water I am afraid to put any of my hand work in water let alone hot water. Lol your work is just Spectacular. I wish mu hand stitching was as beautiful. I seem to have some stitching show up and have to do over at times. I love your work ans so releaved that you got the dye out whew. Stunning quilt! Thank you for the tip on Fabric magnet sheets and Oxy-Clean! You are welcome. Glad to pass along the information! Oh, WOW!! Your quilt is just amazing, and I love the effect of the ombre fabric with your vines. I am new to applique and am very curious about why you were washing your border prior to sewing it to your quilt top. Did you wash the glue and starch out of each individual block before joining them together, as well? I thought the glue and starch could be washed out of the quilt once it was completely finished. Also, I discovered a similar red bleed issue with a current project but not until after I had trimmed my blocks to size. I am hoping that it is just loose dye that will rinse away when I wash the finished quilt with the color catchers, because no way I could wash the trimmed blocks and not get fraying or distortion at the edges. Is the Oxy-Clean a product that you use in the washing machine or for hand washing in the sink? I have one of those HE washers, too, so I’m nervous that my machine might not use enough water to safely rinse all the excess dye away. is a product that can be used both for hand-washing and in the washing machine. I put 2 tbsp of Oxy-Clean in my front-end loader with my border. The good news is that the red came out. I also wash all of my fabric in synthrapol before I cut into it, so I was surprised when the red ran. Thanks for the comment! gorgeous work and I’m so glad your red issue was resolved. Yes, I think cats can hear quilts hitting the floor………. Definitely! Thanks for the comment! I so admire the applique that you do. Beautiful!